would have never enjoyed (right until the 16th century) pure monotheism (not the fake Zoroastrian monotheism that is based on pagan dualism) and the honour of being THE most contributing A’aajim (non-Arabs) who did the greatest service to Islam in the fields of Hadith, Fiqh and even Arabic grammar. Nobody can even come close to them (Sunni Persians) when it comes to any science of Islam, not even many Arabs themselves, this is how Allah honoured and raised their status. 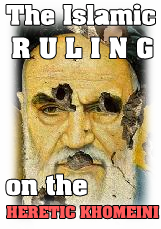 However, Rafidah Shias (who share this perverted understanding with their brothers, the Persian nationalits Anti-Arab and Islam bigots) propapagate weak and fabricated narrations in order to stir up the emotions of Persian Shias claiming that ‘Omar was racist towards Persians and hated them all, without exception. For instance, they say ‘Omar prevented ALL Persians from entering Madinah or to pray in the first Mosque of the Prophet’s Mosque (Mullah Danshmand the infamous Shia preacher who is known for cursing Sunnis and Sahabah in public made such a blunt claim), yet ‘Omar was accompanied by a number of Persian Muslims whom he highly respected and honoured. It was ‘Omar Ibn Al-Khattab (رضوان الله عليه), during his own reign, who appointed a former Persian slave (Salman the Persian/Al-Farsi) as the new “king” of Persia (by appointing Salman Al-Farsi as the Wazir of Al-Mada’in in Iraq which was the previous capital of the Persian empire. It’s south of Baghdad and the remains of Yazgerd the third’s, the last Persian Sassanid emporer are still there). He could have appointed his son or any other Arab, but the matter of fact is that this alleged “greedy” man did not appoint is own sons for ANY position, yet he appointed a Persian over the capital of one of the richest lands of the world. It is also reported that ‘Omar honoured his Wazir minister (Wazir) Salman the Persian (Al-Farsi) whenever Salman visited Madinah. ‘Omar used welcome Salman at the gates of Madinah, embracing the Persian Salman like a noble mane, as (master), yet the Rawafid claim that ‘Omar hated on all Persians, they even ascribe Salman Al-Farsi to themselves claiming that he refused to give Bay’ah to Abu Bakr. The truth is Salman did not just give Bay’ah to Abu Bakr (based on unreliable narrations of Ya’qubi’s tarikh). Authentic narratins plus supportive historical accounts actually prove that Salman happily and without any force pledged his alliance to Abu Bakr then ‘Omar. He worked for and with them, he was the right hand of ‘Omar over all of Persia, this is how much ‘Omar respected him as a Persian Muslim brother and this is how fabricated the Shia narrative is that is always based on hatred and enmity. Excuses such as “Taqiyyah” won’t work since Salman Al-Farsi worked directly under ‘Omar’s order, nobody forced him to work under a so called disbelieving and oppressing usurper. Salman was a lover of Ali, but so were many other Sahabis, and he was also a lover of ‘Omar, he respected them both and never believed in myths such as the Imamate of 12 men who are superior than Prophets or that ‘Omar usurped Ali’s (رضوان الله عليه) right and killed his wive. But it doesn’t stop here with ‘Omar’s support for Persian Muslims. ‘Omar had such a great love for his Muslim Persian brethren that he openly suggested a Persian (companions) for the position of caliphate. Salem the client of Abu Hudhayfah (رضي الله عنهما) , a Persian Sahabi, was from the foremost, the first of the emigrants, a Badri, one of the first Sahabah. He accepted Islam before Salman Al-Farsi, as Salman accepted Islam in Madinah (did not witness the Makkan period at all). He was a highly respected and valued Muslim (among his fellow Muslims), who died while fighting against the forces of Musaylimah during the Wars of Apostasy. This Sahabi was THE master of the Qurra (Qur’an reciters) among ALL the Sahabah. He originated from the heartland of Persia, from the town of “Estakhr” (south of modern day Iran, in the Fars province). Doesn’t sound really “Anti-Persian”, does it? This was the SON of Omar Ibn Al-Khattab, and not just him, but basically the BEST companions of the Prophet used to pray behind a Persian (including ‘Omar and Ali!) because he could recite the Qur’an best! There are are also narrations were the Prophet paid his homage and utmost respect and love to Salem the Persian. ^This narrations has been narrated by the Mother of the Believers ‘Aisha who says that the Prophet صل الله عليه و سلم thanked Allah for having the likes of Salem in his Ummah. As stated before, Omar ibn Al-Khattab famously stated that he would have suggest Salem for the position of the Caliphate had he still been alive. Remember, Omar appointed Salman the Persian as the ruler over entire Persia, yet after all some try to portray him as “Anti-Persian” (based on unreliable narrations or out of context narrations were ‘Omar treated Persian Mushriks such as the Shia saint Abu Lu’lu’ah, the terrorost suice, harshly). When Omar was stabbed (by the coward kafir Abu Lu’lu’ah Al-Majoosi),the Muslims (including Ahl Al-Bayt Sahabis such as Ibn ‘Abbas who never heard of myths such as 12 Imams) asked him to appoint a successor for him but he refused. They insisted, so he mentioned six of the Sahabah. After his death, the nominees appointed one of them as a representative who was Abdul Rahman Ibn Auf. He referred to the opinion of the Muslims and consulted them. Then he declared the bay’ah to Uthman. The Muslims stood up and gave their pledge to Uthman, and theirby he became a Khalif by the pledge of the Muslims and not by the announcement of Abdul Rahman. In the following two Hadiths Omar first does not appoint anyone and in the next Hadith Omar mentioned the name of the six people. In Muslim he reported the same thing in a different Hadith. But from both, Al-Bukhari and Muslim, we find that Omar appointed the six people after the Sahabah insisted on him to do so. Al-Bukhari reported on the authority of Amr bin Maimun when Umar was stabbed to death: “The people realized that he would die… The people said (to ‘Omar), “O chief of the believers! Appoint a successor.” Omar said, “I do not find anyone more suitable for the job than the following persons or group whom Allah’s Apostle had been pleased with before he died.” Then ‘Omar mentioned ‘ALI (why would ‘Omar appoint his alleged enemy and why did ‘Ali joined a Shura in the first place? ), ‘Othman Al-Zubair, Talha, Sad and ‘Abdur-Rahman (bin Auf) and said,”Abdullah bin ‘Omar will be a witness to you, but he will have no share in the rule. حدثنا : عفان ، حدثنا : حماد بن سلمة ، عن علي بن زيد ، عن أبي رافع أن عمر بن الخطاب (ر) كان مستنداً إلى إبن عباس وعنده إبن عمر وسعيد بن زيد (ر) فقال : إعلموا أني لم أقل في الكلالة شيئاًً ولم أستخلف من بعدي أحداًً وأنه من أدرك وفاتي من سبي العرب فهو حر من مال الله عز وجل فقال سعيد بن زيد أما إنك لو أشرت برجل من المسلمين لأتمنك الناس وقد فعل ذلك أبوبكر (ر) وأتمنه الناس فقال عمر (ر) : قد رأيت من أصحابي حرصاً سيئاً وإني جاعل هذا الأمر إلى هؤلاء النفر الستة الذين مات رسول الله (ص) وهو عنهم راض ثم قال عمر (ر) : لو أدركني أحد رجلين ثم جعلت هذا الأمر إليه به سالم مولى أبي حذيفة وأبو عبيدة بن الجراح. […] Omar Ibn Al-Khattab said: “I am not going to appoint anyone [for the position of the Khilafah) after my death and whoever from amongst the captives [such as the the Persians] of the Arabs witnesses my death, then he is a free man, the property of Allah alone.” Then Saeed Ibn Zayd said: “If you would appointa man from the Muslims [for the Khilafah] the people will trust you, Abu bakr Al-Siddiq did it and the people trusted him.” Omar replied back: “[…] surely I shall restrict this matter (Caliphate) to six individuals [Ali, Al-Zubayr etc.] with whom Allah’s Apostle had been pleased with before he died and if one of two people would accompany me [today], then I’d make leave this matter to them, I would select appoint either one of them: Salem (the Persian) Mawla Ibn Abu Hudhayfa or ‘Ubaydallah Ibn Al-Jarrah”. ‘Omar, according Shia sources such as Nahj Al-Balagha was advised by nobody less than Ali himself to go forward with the battle against the arrogant Sassanid Persian Empire (that occupied vast lands of the Arabs, including Yemen and Oman way before any Arab could have even dreamed of attacking Persia) that oppressed Persians before anyone else (with their caste system and depriving lower class people from education). Ali supported Omar and called his army the army of Allah (! ), yet the Rafidah side with Persian Neo-Zoroastrian nationalits and insult Omar and the vast majority of the Sahabah describing them as a bunch of oppressors and usurpers who destroyed their Persian Zoroastrian Empire! This entry was posted in Rebuttals to Anti-Islam rethorics, Sunnah & Rafidi-Shia history of Iran. Bookmark the permalink.